Mix all ingredients together, best second day, if it lasts. What can I say, potatoes, hard boiled eggs, onion, and mayonnaise – how could I not like that? This isn’t the first time I’ve made Cabbage Rolls. Once a year, in german class, we would make this and other traditional german dishes (like German Potato Salad). It had been years since I’d seen a cabbage roll. For the past year, I’ve been enjoying the russian version of the same dish at my favorite cafe/diner near home. This simplified version gave me an excuse to get the slow cooker out. Remove core from cabbage. Steam 12 large outer leaves until limp; drain well. I ended up cutting the whole cabbage in half in order to core it. Steaming the halves softens them enough to separate them from themselves. 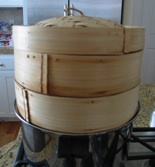 I used my bamboo steamer. In a bowl, combine the egg, tomato sauce, rice, onion, cracker crumbs and soup mix. Crumble beef over mixture and mix well. Make this receipe your own. I don’t like green peppers, so I substituted onions. I may add some shredded carrot next time. Place about 1/3 cup meat mixture on each cabbage leaf. Fold in sides starting at an unfolded edge, and roll up completely to enclose the filling. Secure with toothpicks, if desired. 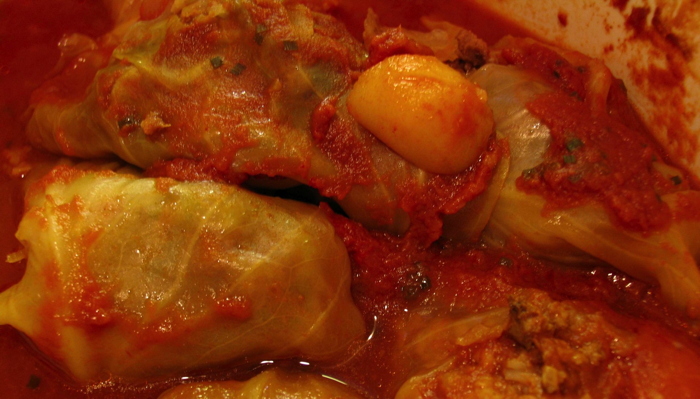 Place cabbage rolls in a slow cooker, seams down. Place potatoes around rolls. Pour V8 juice over rolls. The potatoes weren’t in the original recipe either. I was inspired by a diner hear home that serves the rolls in a broth with potatoes. Cover and cook for 6 – 7 hours or until the filling reaches 160 degrees. I cooked mine on high for 4 hours, and low for 1 hour. Just before serving, sprinkle with salt and cheese or a dollop of sour cream, if desired. I use the same bottle used to make Italian salad dressing.